Our chest tightens, palms begin to get sweaty, and excuses race through our minds when we see those reputable blue lights flash behind us. However, for a couple from North Carolina, the blue lights meant something so much more. The officer who pulled them over had no idea what he was getting himself into, but got the surprise of a lifetime. Sgt. Brian Maynard, a 15-year state trooper veteran, got behind a mini-van on US-64 in Wake County, North Carolina for going 85 mph. The man behind the wheel, Jimmy Baker, shocked Maynard when he jumped out of the vehicle waving his hands and shouting after they had stopped. Officer Maynard was fully prepared to give the erratic minivan a speeding ticket until he heard what Baker was shouting. “My wife’s in labor and I really need help.’”, pleaded Baker, according to CBS 6. Before that point, Laura Baker thought she was having a “normal” labor. Contractions had begun earlier in the evening so they decided to go to the hospital to check on the pregnancy. Shortly after departing, labor accelerated quickly. Baker said, “I can not control this, we’re not going to make it there”, reported CBS 6. That’s when the frantic husband saw Maynard’s patrol vehicle and began speeding and flickering his lights to get the officer’s attention. It was just in time too! Right there on the side of the highway, Laura’s water broke. With no time to get to a hospital, Maynard called for an EMS team to come to the location. Preparing the best way he could, Maynard grabbed gloves and a blanket, saying “OK, well, we’re going to do this right here, me and you,’” according to WSOCTV. Could you imagine, having your baby on the side of the highway in the seat of a minivan by a complete stranger? As mothers, we have everything planned out the way we want our labor and deliveries to go; our chosen doctor or midwife available, a certain birthing position, and our ambiance essentials to make it as comfortable as possible. There is no mother that writes in her birthing plan that she wants to have a curbside delivery by untrained non-medical personnel. And if the Bakers were like most families in a minivan, the seats are not exactly hygienic, with young athletes and fast food being the primary occupants. But, it just goes to show that despite forming the perfect birthing plan, the baby is going to come when they want and how they want. Baker and Maynard held Laura’s hand urging her to wait for the EMS team as if she could stop the baby from descending. The EMS team finally arrived, assisting the state trooper with an emergency delivery in the front seat after realizing they would not be able to get Baker on a stretcher. “My husband and the trooper were nervous, because they certainly weren’t prepared,” the brave mother said, according to CBS 6. When it was all said and done, Laura was on her way to WakeMed Hospital holding baby Halyn in her arms. Baker is extremely grateful for Maynard’s quick response and calm approach, and for the EMS team for doing what they could for a “sanitary and healthy” delivery of her baby girl. On the way home from the hospital, Baker plans on showing the EMS team the little miracle they brought into the world. 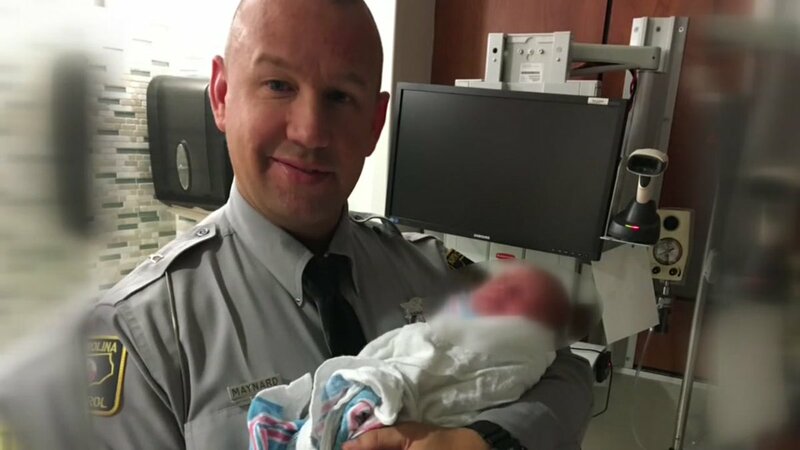 Being a state trooper, Maynard is used to seeing a lot of death, but was happy “to be a part of the process that actually brings a life into this world”, reported WSOCTV. Although, the experience was “interesting” and “scary”, Maynard was grateful for the change of pace. It was reported by WSOCTV that the patrol car’s dashcam caught a lot of the excitement of the evening. A copy of that footage would be a unique addition to the family album. Although this mom actually had it happen, she handled the experience with grace and a good sense of humor. We are thankful to all the emergency personnel who are there when we need them. Please let us know in the comments section if you have an amazing birth story, or what you think of the trooper’s quick response.